Photo measuring 3.5 x 3.5 inches. I went to the used bookstore near my apartment to look for a specific book for a friend’s birthday. Defeated in my quest, I wandered over to the boxes of vintage photos, uncertain if I wanted to buy any. But then I saw this one, and suddenly I was off on a buying spree. I got a bunch of fun ones to share, but here is the first one. It makes me smile. I love the colors. I love their delighted expressions. And I’m intrigued by what’s going on here. Are they dressed for a party? Are they at the party? Is this their house? Why is he holding a single candle when there are three more matching ones on the table behind him? Is the other thing in his hands some sort of food package, like a TV dinner? Is the red thing in her hands a piece of glassware that’s part of a set with the one on the table behind her? Does her giddy expression come in part from whatever is in her glass? Whatever is going on here, it looks like a good time. Great fun! I don’t often see mid-century photos for sale, and when I do, I don’t always bother to look at them. The expressions in this one make it a real winner! Funny to recognize things like that, isn’t it? You are right, this is a great photo! My guess is that he is holding a cake and the candle is acting as his birthday candle. An impromptu celebration maybe? The thing he is holding looks to me like a foil cake tin, Or it could be a foil wrapped loaf cake. That’s probably a good guess! At first I thought he was holding an ice cube tray, but after I blew it up and looked closer, I realized it was something more like a foil food container. It seemed a bit small for a TV dinner, so I think your guess of a cake is a good one. Having recently celebrated my birthday and my friends insisted I blow out a candle – a dinner candle was used lol. Ha! Well, happy belated birthday, Mrs. Marvel. 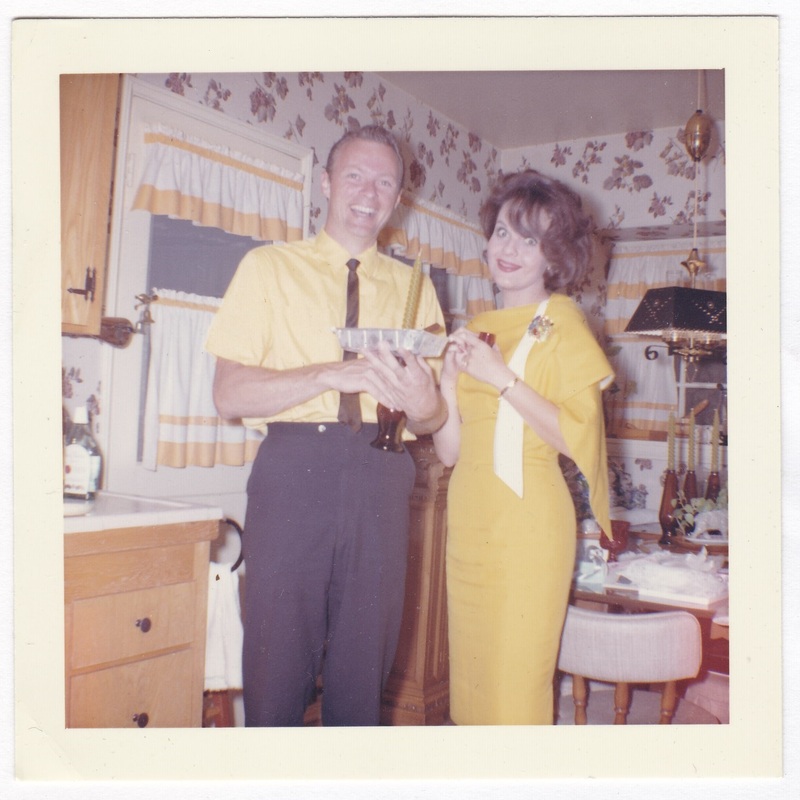 It is a bit sobering to realize the “mid-century” photos in my personal albums are considered “vintage”. Soooo very the 70s! Ha! Funny, I thought it was even older, but I could easily be wrong. Glad you enjoy it!